On the heels of Monday’s post, Whistleblower Reveals Effort of Employer to Crush Medicare for All, comes the following from Healthcare Dive. It seems that bashing Medicare for All has an economic impact after all; just not on the company doing the bashing. Aren’t we sick (get it) and tired of Wall Street and their corporate CEO allies determining our health care system, which is just a mechanism for them to profit from other’s misfortunes or luck at not getting sick? When will we stop letting these vultures pick away at the carcass of the American health care system for the benefit of their stakeholders, investors, and the medical-industrial complex? The other day, on Fox News, Bernie Sanders attended a town hall in which the host asked the audience if they were willing to switch from an employer-based health care system to one provided by the government, as Senator Sanders and others have advocated. The host was shocked to learn that the answer was yes from the audience. So let me get this straight. A Fox News audience wants Medicare for All, but a corporate CEO in the medical-industrial complex can veto their wishes. Is this a democracy or a plutocracy? The biggest private payer beat Wall Street expectations on Tuesday, but a rebuke of plans to expand Medicare weighed on health companies. This entry was posted in Health Care, Health Care Reform, insurers, medical-industrial complex, Medicare for All, profiteering, Single Payer, stakeholders and tagged Medicare for All, Single Payer, UnitedHealthCare on April 17, 2019 by Transforming Workers' Comp. An employee at the insurance giant UnitedHealthcare leaked a video of his boss bragging about the company’s campaign to preserve America’s for-profit healthcare system. “I felt Americans needed to know exactly who it is that’s fighting against the idea that healthcare is a right, not a privilege,” the anonymous whistleblower told the Washington Post‘s Jeff Stein. UnitedHealthcare CEO Steve Nelson boasted at an employee town hall about how much his company is doing to undermine Medicare for All, which is rapidly gaining support in Congress. So begins an article from Common Dreams.org by staff writer Jake Johnson. Naturally, UnitedHealthCare is not the only insurance company that is actively seeking to thwart the move towards Medicare for All, but this is the first time that an insider actually provided the media with proof that their leaders are engaged in such activities. As I wrote in my post, By What Right?, these individuals believe they can supersede the right of all Americans to have decent, affordable health care that does not force them into bankruptcy, or to go without because they cannot afford treatment for serious illnesses or diseases, or expensive medications. Like the individuals I cited in that post, Mr. Nelson and his colleagues at other insurance companies are defending a turf that is indefensible. Their only motive is greed and profit at the expense of those who suffer from disease or life-threatening illnesses. They are protecting their companies bottom-lines and their investors’ money, and don’t care about the people who need medicines and treatments that can extend their lives or save their lives. How much longer will we let the Steven Nelson’s dictate to the American people what form our health care takes, and who gets to decide who gets covered and who doesn’t. He shouldn’t, and neither should anyone else in the medical-industrial complex. This entry was posted in Corporate Executives, Health Care, Health Care Reform, Health Insurance, Health Plans, insurers, medical-industrial complex, Medicare for All, Single Payer and tagged Health Care, Health Care Reform, Medicare for All, Single Payer, UnitedHealthCare, Whistleblower on April 16, 2019 by Transforming Workers' Comp. Yesterday, Sen. Bernie Sanders introduced the Medicare for All Act for 2019, along with 19 co-sponsors in the Senate. * Eligibility: Covers everyone residing in the U.S.
* Benefits: Covers medically-necessary services including primary and preventive care, mental health care, reproductive care (bans the Hyde Amendment), vision and dental care, and prescription drugs. This bill also provides home- and community-based long-term services and supports, which were not covered in the 2017 Medicare for All Act. * Patient Choice: Provides full choice of any participating doctor or hospital. Providers may not dual-practice within and outside the Medicare system. * Patient Costs: Provides first-dollar coverage without premiums, deductibles or co-pays for medical services, and prohibits balance billing. Co-pays for some brand-name prescription drugs. * Cost Controls: Prohibits duplicate coverage. Drug prices negotiated with manufacturers. * Timeline: Provides for a four-year transition. In year one, improves Medicare by adding dental, vision and hearing benefits and lowering out-of-pocket costs for Parts A & B; also lowers eligibility age to 55 and allows anyone to buy into the Medicare program. In year two, lowers eligibility to 45, and to 35 in year three. * Funding hospitals through global budgets, with separate funding for capital projects: A “global budget” is a lump sum paid to hospitals and similar institutions to cover operating expenses, eliminating wasteful per-patient billing. Global budgets could not be used for capital projects like expansion or modernization (which would be funded separately), advertising, profit, or bonuses. Global budgeting minimizes hospitals’ incentives to avoid (or seek out) particular patients or services, inflate volumes, or up-code. Funding capital projects separately, in turn, allows us to ensure that new hospitals and facilities are built where they are needed, not simply where profits are highest. They also allow us to control long term cost growth. * Ending “value-based” payment systems and other pay-for-performance schemes: This bill continues current flawed Medicare payment methods, including alternative payment models (including Accountable Care Organizations) established under the ACA, and the Medicare Access and CHIP Reauthorization Act of 2015 (MACRA). Studies show these payment programs fail to improve quality or reduce costs, while penalizing hospitals and doctors that care for the poorest and sickest patients. * Establishing a national long-term care program: This bill includes home- and community-based long-term services and supports, a laudable improvement from the 2017 bill. However, institutional long-term care coverage for seniors and people with disabilities will continue to be covered under state-based Medicaid plans, complete with a maintenance of effort provision. PNHP recommends that Sen. Sanders include institutional long-term care in the national Medicare program, as it is in Rep. Pramila Jayapal’s single-payer bill, H.R. 1384. * Banning investor-owned health facilities: For-profit health care facilities and agencies provide lower-quality care at higher costs than nonprofits, resulting in worse outcomes and higher costs compared to not-for-profit providers. Medicare for All should provide a path for the orderly conversion of investor-owned, for-profit health-care providers to not-for-profit status. * Fully covering all medications, without co-payment: Sen. Sanders’ bill excludes cost-sharing for health care services. However, it does require small patient co-pays (up to $200 annually) on certain non-preventive prescription drugs. Research shows that co-pays of any kind discourage patients from seeking needed medical care, increasing sickness and long-term costs. Experience in other nations prove that they are not needed for cost control. This entry was posted in ACA, Access to care, Affordable Care Act, Health Care, Health Care Reform, Health Care Spending, Health Policy, Insurance, legislation, Medicare for All, PNHP, Single Payer and tagged ACA, Affordable Care Act, Health Care, Health Care Reform, legislation, Medicare for All, Single Payer on April 11, 2019 by Transforming Workers' Comp. 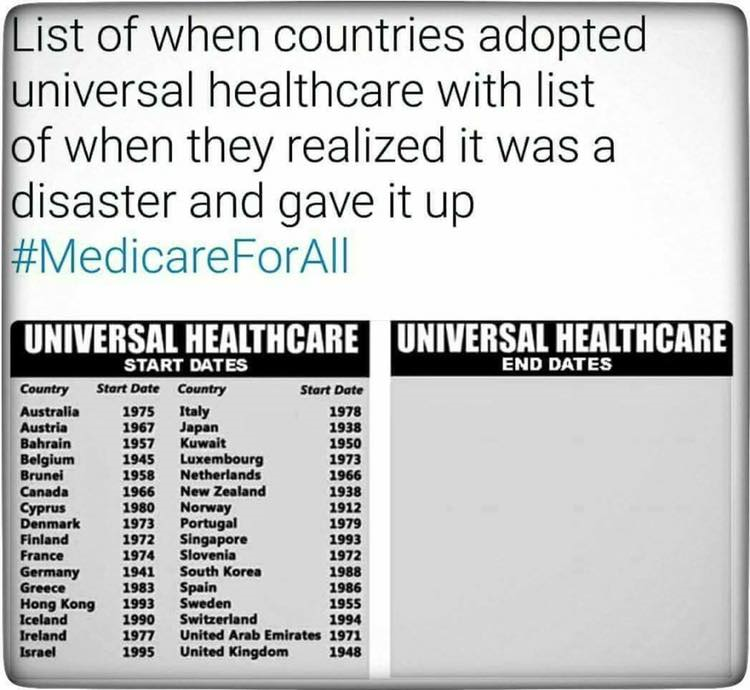 The graphic below shows those countries that adopted universal health care and the dates they did so. It also shows the dates those countries ended universal health care. Notice a pattern? They never did. But we are the only country to not offer universal health care, and are resisting doing so because of a medical-industrial complex that is greedy, profit-driven, wedded to an outdated ideological philosophy of the role of government and social services, including health care, all so that Wall Street, insurance companies, pharmaceutical companies, device manufacturers, large hospital systems, and consultants and service providers to the industry can get their cut of the pie. And notice that none of them are Socialist. This entry was posted in Australia, Canada, Europe, Greece, Health Care, Health Care Reform, Israel, Middle East, Singapore, Single Payer, South Korea, Spain, United Kingdom, Universal Health Care and tagged Health Care, Health Care Reform, Single Payer, Universal Health Care on April 2, 2019 by Transforming Workers' Comp. Richard’s Note: A shout-out to Don McCanne for posting this today from the Annals of Internal Medicine, which is providing the full article for free. The authors, Steffie Woolhandler and David Himmelstein, both MDs, should be familiar to readers as two of the authors I covered in my review of the Waitzkin, et al. book, Health Care Under the Knife: Moving Beyond Capitalism for Our Health. In the spirit of the AIM, I am posting the entire article below with link to the original. It is that important. examination rooms, and physicians are burning out. according to a simplified fee schedule or receive salaries from hospitals or group practices. related documentation and transaction costs, which currently consume nearly one third of U.S.
would counterbalance the costs of utilization increases from expanded and upgraded coverage. implemented to fund the reform. Democrats during the 2009 ACA debate. comprehensiveness of existing coverage; and modestly increase national health expenditures. Medicare’s benefits, although copayments and deductibles (capped at $3500) would remain. Advantage (MA) plans (which inflate Medicare’s costs ) and accountable care organizations. therefore sacrifice much of the administrative savings available under single-payer plans. plan. This strategy would turn the latter plan into a de facto high-risk pool. over the next 10 years. however, deregulating providers and insurers would probably increase them. persistent problems with access and quality triggered a roiling debate over single-payer plans. 1 of several proposals promising broadened coverage on terms friendlier to private insurers. fruition until passage of the ACA. Nixon’s vision is unsustainable. President Trump would veer further down the market path. for-All proponents aspire to decouple care from commerce. This entry was posted in ACA, Affordable Care Act, Congress, Democrats, Federal Government, Health Care, Health Care Costs, Health Care Reform, Health Care Spending, Health Plans, Health Policy, Insurance, insurers, Medicare, Medicare for All, pharmaceutical industry, Republicans, Single Payer, Universal Health Care and tagged "Medicare for More", ACA, Affordable Care Act, Congress, Democrats, Health Care, Health Care Reform, Health Policy, Medicare, Medicare for All, Medicare for America, public option, Republicans, Single Payer on April 2, 2019 by Transforming Workers' Comp. Revelations this week that the Orangutan Administration is going ahead with plans to repeal the ACA, as reported by myself and Joe Paduda, as well as the announcement by Education Secretary Betsy (I have ten yachts) DeVos, that her budget calls for cutting $18 million from Special Olympics, raises the question, “why are Republicans so mean?” and why do they hate the poor and those not like them? This article will explore this question from an economic, ideological, political and sociological perspective, citing several previously published articles asking the same question as the title above. It is certainly not definitive, but does suggest some possible explanations. To begin with, a little history. The Republican Party was formed due to the inability of the Whig Party to deal with the question of slavery and the disappointment many Northern Democrats had with their Southern brethren over this issue, one that occupied a central focus in the second quarter of the first half of the 19th century. While that twenty-five year period ended in 1850, it is important to note that the GOP was founded in 1854, which is still in the range of the time frame. After the Civil War, the Republican Party was made up of two wings: the Radical Republicans who favored Reconstruction and harsh treatment of former Southern Confederates (this will have a bearing on our discussion later) and the conservatives who were aligned with the Eastern bankers and industrialists. In fact, it was the conservatives who, as pointed out in the Spielberg motion picture, “Lincoln”, that made it possible for the passage of the 13th Amendment when they were assured by the President that there were no Southern negotiators in Washington (They were on a riverboat in Virginia being guarded by African-American Union soldiers). However, after the election of 1876, when Rutherford Hayes became President by promising the South to end Reconstruction, the Radical Republicans were slowly replaced by more conservative Northern Republicans loyal to the industrialists who would dominate the second quarter of the second half of the 19th century, and thus lead to future calls for reform and addressing of the effects industrialization had on the working class. So as their wealth increased, so too did the misery and poverty of the working class, and this led to the rise within the GOP of a progressive movement, and a likewise movement among the rural population in the Midwest in the form of populism. With the ascendancy of Theodore Roosevelt to the Presidency in 1901, progressivism took off, and many Republicans led the way for political, economic, and social reform. A brief return to the past in the 1920s under three successive Republican Presidents was followed by the election of FDR and the Democrats controlling Congress for decades to come, making more reform possible, and creating the largest middle class in history. By the mid-20th century , the Republican Party had three wings: conservatives, moderates, and liberals. Barry Goldwater’s run in 1964, and Robert Taft’s in 1952 sort to change the dynamics in favor of the conservatives, but only meant they lost the battle, but won the war. Then came Reagan, the first celebrity President. He brought victory to the conservatives and into government. Remember, he said that government was not the solution, government was the problem, and thus, that is how the GOP would operate when they took over. Turning to the economic aspect of why Republicans are mean, let us look at something written a hundred years ago, Max Weber’s essay, The Protestant Ethic and the Spirit of Capitalism. So in this context, Protestantism, or rather its Calvinist form, which influenced the Puritans of New England, formed the moral and ethical basis for the rise of modern capitalism, and while the descendants of the Puritans today in New England are decidedly more liberal than in the past, due to evangelical missionaries in the late 18th and throughout the 19th centuries, in what historians call the Great Awakenings, these values were transmitted to people in the South and Midwest, or were carried with them during western expansion. As for the South, as mentioned earlier, the debate over slavery has some bearing on why many of today’s Republican leaders in Congress are Southerners, and what that means for the country’s direction these past thirty years or so. “…the plantation aristocracy of the lowland South, which has been notable throughout its 400-year history for its utter lack of civic interest, its hostility to the very ideas of democracy and human rights, its love of hierarchy, its fear of technology and progress, its reliance on brutality and violence to maintain “order,” and its outright celebration of inequality as an order divinely ordained by God. This would appear to not only apply to the justification for the South’s secession from the Union in the 19th century, but for the way Southern politicians, both Democrats (remember, many were Southerners who were promised committee chairmanships by FDR to get the New Deal passed) and Republicans after passage of the Civil Rights Act in 1964 led to Southerners fleeing the Democratic Party for what LBJ said would be for a generation, have acted towards any legislation that would cause them to lose their liberty. Today, we call that White Privilege. For an ideological perspective, Marc-William Palen, in Foreign Policy in Focus, provides us with a clear understanding that the Republican Party is not merely a party of classical liberalism, but something different from what it was when it was founded. Palen suggests that if the Republicans current ideology is not found in classical liberalism, then where does it come from? Palen says, Ayn Rand’s pronounced atheism and intellectual elitism certainly does not align with the ideological outlook of most Republicans. And, he says, there is perhaps an element of a Social Darwinian “survival of the fittest” ethos—although no Republican politician is likely to admit to subscribing to anything associated with the theory of evolution. “…a large part of Republican ideological inspiration stems from fear. In particular, it is a reactionary ideological response to the turbulent upheavals inherent in an increasingly globalizing world. Such fears—let’s call it “globaphobia”—are frequently expressed on issues such as immigration, global terrorism, global warming, and American participation in international institutions like the United Nations. The massive federal intervention in the so-called free market following the global financial meltdown invariably exacerbated Republican fears that government intrusion in the market— and Keynesian economics more generally—would eventually undermine American individualism, citing Douglas LaBier. 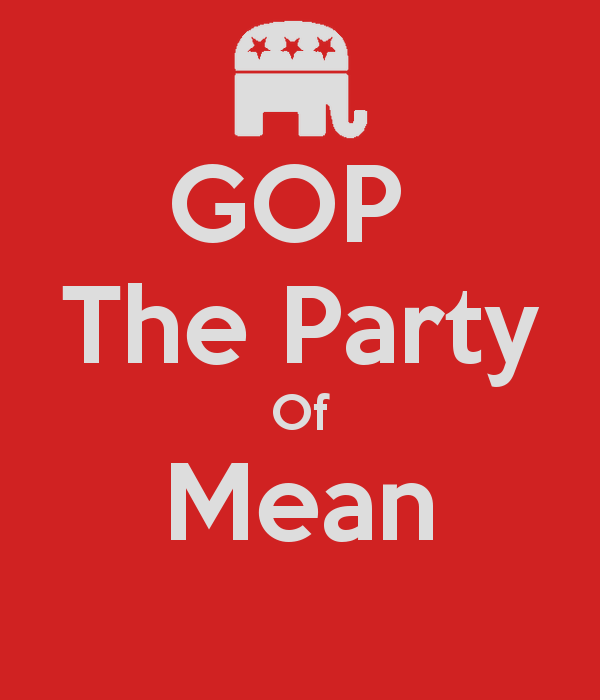 As we have seen, there is no one answer to why Republicans are mean. It seems to be a combination of factors all valid and relevant to today’s political climate in Washington and in the nation at large. But nothing ever is just as simple as being mean. since we are dealing with human beings and not machines. For our purposes, health care is just one more “liberty” conservatives are afraid of losing, so therefore, they will deny it to others, so that they can have more of it. Any discussion of universal coverage in a single payer health care system is a threat to their liberty, and therefore must be opposed. Add to that, the economic loss of profit and gain by those in the medical-industrial complex, and you get a clearer picture of the problem. But to answer the question raised at the beginning, why are the Republicans so mean? It’s because it is in their DNA passed on from one generation of conservatives to another like our genes are passed down from our parents, grandparents, and so on. This entry was posted in American History, Capitalism, Democrats, Federal Government, Health Care, Liberalism, libertarianism, medical-industrial complex, Medicare for All, Progressive Era, reform, Republicans, Single Payer and tagged classical liberalism, Democrats, Health Care, ideology, mean, Medicare for All, moral sentiments, Republicans, Single Payer on March 27, 2019 by Transforming Workers' Comp.